In the wake of sticking throttles, hard brake pedals, and demonic power steering, Toyota may finally be forced to take some time off for soul searching. As we all know, Toyota executives constantly monitor beaterblog for the latest in automotive trends. Therefore, let this be a place where we kindly remind Toyota of what it used to be: maker of frumpy, odd, reliable, and fun cars that people enjoyed driving and formed personal bonds with. 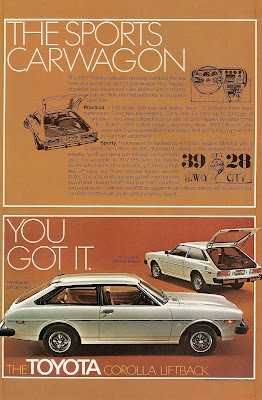 The 1977 Toyota Corolla Liftback is one of these cars. Part Volvo P1800ES, part Mustang II, and part Corolla, these cars were meant to serve a purpose with that uniquely 70's Japanese style, if you are comfortable with calling it that. We are. loved this car. I had a '78 SR5 metallic blue. How Many Cambodian Flood Cars Can You ID? Hot Wheels Carrying Case and Cars from 1968!